For as long as people have wanted to live by the water, there has been a conflict between humans and the sea – most notably when hurricanes and other storm events lash the Rhode Island coastline. And with more people and structures located along the shoreline compared to decades ago, and stronger storm events as a byproduct of climate change, these factors will increase the vulnerability of coastal populations. Accordingly, the CRMC is working with community and state partners to address coastal hazards. While the majority of residents live in coastal communities – more than 65 percent, according to the Watershed Counts report – this number could be greater when considering the number of people who visit Rhode Island for the summer. For example, Block Island’s population – modest with just over 1,000 year-round residents – grows to 15,000 – 20,000 during the summer, according to the report. In Rhode Island, there are approximately 7,000 people living within a 7-foot sea level rise inundation zone, according to a R.I. Statewide Planning report. 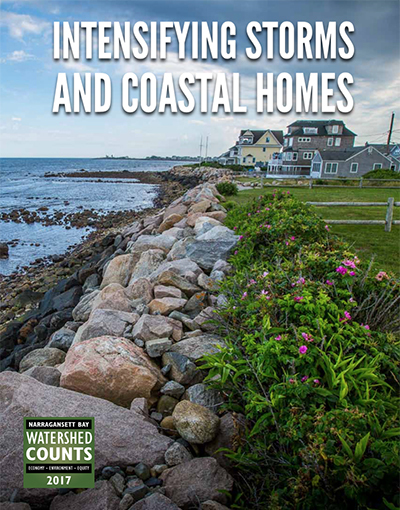 In an effort to address the risks associated with increased storms, as well as sea level rise, erosion and flooding events as a result of climate change, the CRMC along with its partners is developing the R.I. Shoreline Change (Beach) Special Area Management Plan, which seeks to provide planners with tools to make informed decisions about the future. Through publicly available online mapping tools like STORMTOOLS, SLAMM, and the Coastal Environmental Risk Index (CERI), the CRMC and its partners hope to better prepare municipalities and property owners for the realities more intense storms will bring. However, the CRMC often hears from coastal property owners that a “solution” is to build a wall. The CRMC prohibits new shoreline protection structures adjacent to Type 1 (conservation area) waters (most of the southern RI coastline), as well as areas deemed unsuitable by its professional staff of biologists and engineers because of extreme wave action, flooding and erosion. Pre-existing shoreline protection structures (those in existence before the creation of the CRMC) require permits for maintenance or alterations. The question remains, however, whether a structural shoreline protection facility is the best solution for the coastline. As cited in the Watershed Counts report, as well as in many public forums, staff reports and other CRMC materials regarding this issue, these structures are costly (often tens of millions of dollars), and result in the loss of the beach in front of them, often cause or exacerbate erosion problems at their terminuses, and are subjected to the same forces as the homes they are supposed to protect. The CRMC encourages nature-based, less permanent protection facilities wherever appropriate, as well as elevation of homes or structures and relocation father back from the coastal feature. 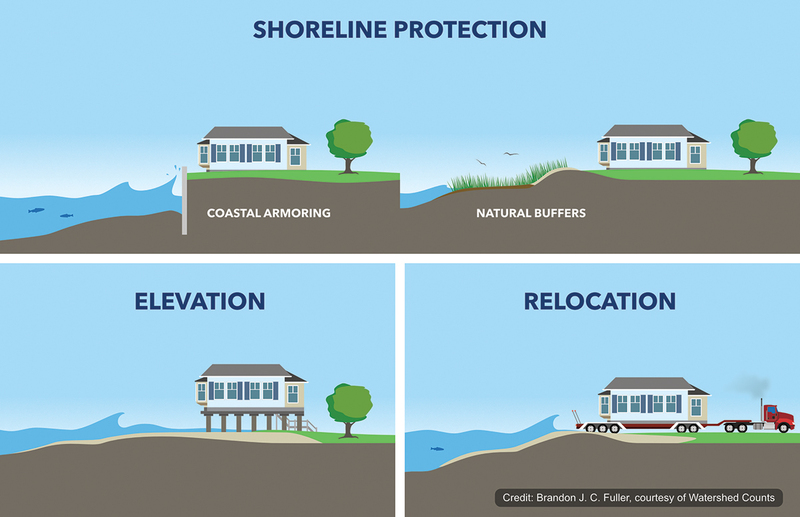 When completed, the Shoreline Change SAMP will include guidance for assessing, acknowledging and preparing for increased risk via a specific coastal hazard permitting process for new and significantly altered structures.